The High Drift Oak & White Bar Stool successfully combines contrasting materials to create a contemporary design with a real retro feel. Fixed at a taller height, it is suitable for high kitchen worktops and commercial bars, with all the benefits of our ever-popular Drift Stool. Stylish and versatile, the High Drift will complement a variety of spaces with its unique appearance. 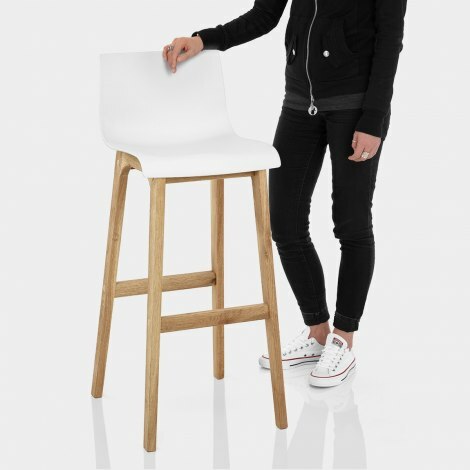 The ergonomic seat is fashioned from crisp matte white resin for a minimalist appeal and is complete with a supportive mid height backrest. Formed of solid oak and with a seat height of 78cm, the sturdy four-legged frame includes bracing bars to strengthen the design and also double as a practical footrest.
" Very stylish and looks great in our new kitchen"
Very pleased with our purchase. From ordering online to receiving the stools, we received excellent service from Atlantic and would definitely shop with them again. Very pleased with the stools. Everyone who comes round comments on them. Very stylish. Very comfy and easy to assemble. This stool looks great, is very stylish and looks great in our new kitchen. The plastic seat is good quality and so are the oak legs. They are a great price and well worth the money. Bought a pair of these stools for our new kitchen. They look great, are good quality and comfy. Delivery and order all very easy. Was a bit worried about assembling them, as we're not the greatest at that sort of thing. But managed it pretty easily. Would recommend.